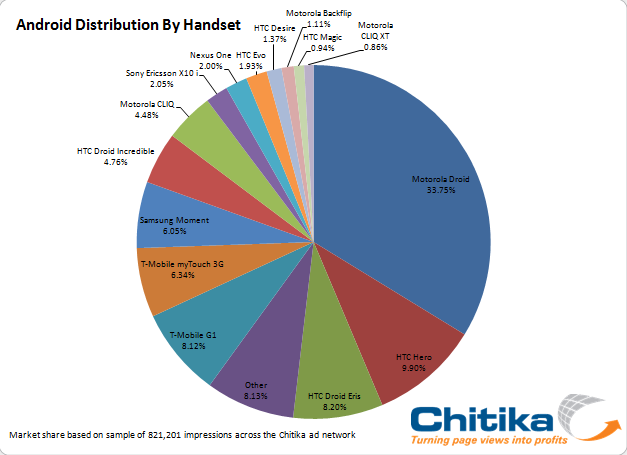 Online ad company Chitika, released information today showing Android distribution numbers by handset and carrier. As you may have expected, your Motorola Droid is completely stealing the show. Making up for just over a 3rd of all Android handsets on the market, you can easily attribute the success to the monstrosity of a marketing campaign which continues to this date, and a nicely timed holiday release in 2009. Seriously though, one third. Wow. I find it a little interesting that the Droid Incredible managed to come in at the 8th spot, well ahead of the Nexus One and after weeks of backorders dating back to its release date. The Droid Eris at 3rd overall is also worth noting and has me thinking about showing it a little more love…well until Verizon discontinues it anyway. 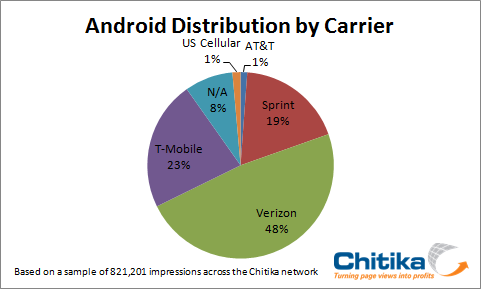 And I don’t think anyone needs a reminder that the Droid X and Droid 2 are just weeks away and should easily propel 2 more Verizon devices into the top 10 all while helping Big Red grab more than 50% of the entire Android market. Oh and AT&T at 1%? No comment.